London 11 November 2014 – After a wait of almost 200 years, the allied powers who defeated Napoleon in the Battle of Waterloo have finally been presented with the original commemorative Waterloo Medal intended for them at a ceremony held at Apsley House, official home of the Duke of Wellington. 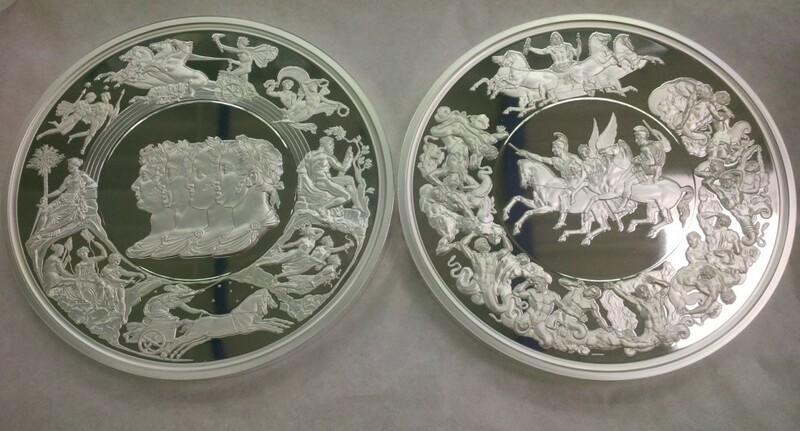 Waterloo 200, the government-backed organisation overseeing the celebrations of the 200th anniversary of the Battle of Waterloo, worked in partnership with The London Mint Office and Worcestershire Medal Service to have the medals produced for the very first time in its original size. They were originally commissioned in 1815 and designed by renowned engraver Benedetto Pistrucci – but never struck. Their Excellencies Dr Emil Brix, Austrian Ambassador, Mr Alexander Vladimirovich Yakovenko, Russian Ambassador and Ms Tania Freiin von Uslar-Gleichen, German Deputy Ambassador, each received the Pistrucci Medal on behalf of their country. This was presented to them by Lord Douro, son of the Duke of Wellington, after a two minute silence was observed in honour of Remembrance Day and a number of talks including an account of the significance of the Battle of Waterloo and the allied co-operation by historian Peter Snow. Angela Pistrucci, 3rd great niece of the late engraver, Sir Evelyn Webb-Carter on behalf of the Waterloo Association, the Royal Mint Museum and the Waterloo Committee from Belgium were also presented with the medal as well as Lord Douro himself, who received it on behalf of the Duke of Wellington. Her Majesty the Queen will also be receiving the Waterloo Medal which will be presented to her on a later date by Lord Douro and will become part of her personal collection. In addition, Their Excellencies Mr Guy Troveroy, Belgian Ambassador and Mrs Magriet Leemhuis, Dutch Deputy Ambassador each received a commemorative silver Waterloo Campaign Medal on behalf of their country for the essential roles their nations also played in the Battle of Waterloo. The commemorative Pistrucci medal was commissioned only 10 days after the allied victory over Napoleon in Waterloo by the Duke of Wellington’s brother Sir William Wellesley Pole, who tasked Pistrucci with its design and production. It took Pistrucci over 30 years to complete the moulds, known as dies, not only due to the mammoth dimensions of the medal, which is 139mm in diameter, much larger than any previously created, but also due to the complexity and intricacy of the design itself. The medal features on one side the four busts of the allied rulers each wearing a laurel wreath, surrounded by allegorical scenes representing the battle and the peace that followed. On the obverse the Duke of Wellington and Prince Blücher, the Prussian Field Marshall are depicted riding their horses into battle, while the Gigantomachy – the Greek mythological battle between the Giants and the gods of Olympia – is featured around the central figures. By the time the dies were completed in 1849 the four allied sovereigns who were to receive the medal had all died and the medal was never struck. At the event Sir Evelyn Webb-Carter, Chairman of Waterloo 200, also announced that up to 500,000 commemorative Waterloo Campaign medals, struck in bronze, are to be given free to the UK public as a gift from Waterloo 200, funded by the London Mint Office. These medals will be available on a first-come-first service via www.200waterloo.co.uk. Worcestershire Medal Service, Medallist to Her Majesty the Queen, produced the medals on behalf of the London Mint Office, ensuring that every detail in Pistrucci’s legendary medal was faithfully reproduced.